Hours after South Korea officials detected an “artificial earthquake” Wednesday, North Korea said it successfully tested a “miniaturized” hydrogen bomb. North Korean state media broadcasted a special announcement that praised the test for bringing the country’s “nuclear might to the next level” and providing a weapon to better fend off enemies, including the United States, the Associated Press reported. State media said the bomb, which can be thousands of times more powerful than atomic bombs, was detonated at 10 a.m. local time. USGS now has the DPRK event at Mb=5.1 and 0 km depth. It's a test. How do we verify what North Korea says it tested? USAEDS sensors (https://t.co/SdWd0otrRb) and the CTBTO's IMS (https://t.co/e5mT4pYOQW). The U.S. Geological Survey reported a 5.1 magnitude earthquake 27 miles north-northwest of Kilju, a North Korean town close to the Punggye-ri Nuclear Test Facility, where three previous nuclear tests occurred since 2006. North Korea’s last nuclear test was in February 2013. 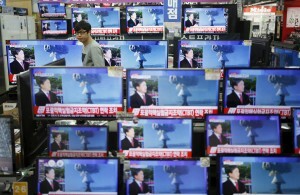 Some experts, however, are skeptical North Korea detonated an H-bomb. South Korea’s spy agency told the AP that the quake — and an explosive yield of 6.0 kilotons — was too small for an H-bomb detonation. White House spokesman Josh Earnest said an initial analysis from the U.S. government was inconsistent with North Korea’s announcement of a successful nuclear test. I doubt DPRK exploded a real H-Bomb. More likely a "boosted" weapon with tritium added to increase the yield of a fission bomb. The size of the seismic disturbance was similar to the 2013 test, which was suspected to be a single-stage fission device — not an H-bomb. This new nuclear test, however, means that North Korea aims to advance its nuclear program “with little regard for the major political and diplomatic costs that will inevitably accompany this unwelcome development,” John Nilsson-Wright of the Asia Program at Chatham House told the BBC. This fourth nuclear test came weeks after North Korea demonstrated a submarine-launched ballistic missile.